Most Gottlieb System 80 MPU boards came with "PROM" chips installed on the board for game ROMs (PROM1 and sometimes PROM2) and system ROMs (U2 and U3). The original chips used on these boards are obsolete and no longer available, or the equipment needed to program such chips is no longer around, so the only practical alternative is to replace them with modern EPROM type chips. Most game ROM (PROM1 and PROM2) chips can be replaced with 2716 EPROM chips. System ROMs U2 and U3 can be combined and replaced with a single 2764 EPROM. It is also possible to replace each of U2 and U3 with a modified 2532 EPROM chip, but this process is much more involved and we do not have comprehensive information on exactly how to do it. Replacing any of the original chips may require some modifications to be done to the boards, in order for the new replacement chips to work. Replacing Game ROMs (PROM1 and PROM2) with 2716 EPROM. Replacing System ROMs (U2 and U3) with a single 2764 EPROM. The information provided here is for your reference in modifying your own circuit board. Any modifications or work done on your board, or your game, are done so at your own risk. We (Action Pinball) are not responsible for any problems that may arise which may be related, or not related, to the information given below. Read our Notice and Disclaimer before attempting any of the work described below. Late model Gottlieb System 80 MPU boards came from the factory with a 2716 EPROM used in locations PROM1 and sometimes location PROM2 (depending on the game). For these models, no modifications to the board are necessary- simply replace the chip. Some early Gottlieb System 80 MPU boards may need to be modified when using replacement EPROM chips. Some early boards may not need to be modified. Before replacing chips, you should determine which board your game is supposed to use, which board you have, and what may or may not need to be done. Many games have had boards swapped in/out of them over the years, so may not have what the game was originally supposed to use. This can pose a problem if you are trying to install replacement ROM chips on a board that cannot use them, or that requires modifications to use them. Board part numbers should be included in your game manual so that you can determine which board you have, or which board you should have. If you need a replacement manual, e-mail us, or see our Paperwork Items page- we may have, or be able to get, a manual for your game. Special thanks to Mr. Steve Charland for providing the following information. Steve's contributions to and knowledge of System 80 Gottlieb pinball games is outstanding and very much appreciated in helping to keep these great games going! DET. PB03-D102-001 This is the first System 80 CPU board. This board is only used on the first 5 System 80 games (Spiderman (#653), Panthera (#652), Circus (#654), Counterforce (#656), Star Race (#657)). It uses 2 game ROM chips (PROM1 and PROM2). This board must be modified for using replacement PROM1 and/or PROM2 chips, or replacment U2 and U3 chips. See modification information at the bottom of this section. DET. PB03-D107-001 This is the board that the upgrade described below will make. So if you already have this board, it doesn't need to be modified for replacement PROM1 and/or PROM2 chips- it should use standard 2716 EPROM replacement chips, without any modifications. It also has some trace changes (ie: the modification) to accommodate more memory for the single ROM chips. This board will require modification if replacing U2 and U3 chips. DET. PB03-D107-003 This board is the same as the D107-001 but they changed the placement of the ground on the board to accommodate a ground screw. They ended up not using this change. It turns out that Clay's site does use it in the upgrade modifications. D20869 This board is the same as the D107 also, but it has socketed U2 & U3 chip locations. The IC's that go there (system ROM chips- not game ROM chips) are now for 6 or 7 digit display systems depending on which game you have. Also the PROM 2 game ROM socket is removed and not used so only one game ROM chip can be used on this board (PROM1)- the 2-game-ROM system won't work. Later, the system 80B came along and it used this board too. The only changes were to the display IC's. Some were omitted and instead were jumpers. Cut trace extending to the left from between pins 6 & 7 of Z-10. Jumper Z-10 pin 13 to the pad located just below and to the right of Z-9 pin 7. Cut traces leading to PROM socket 1 pins 21 and 19. Jump PROM socket 1 pin 21 to PROM socket 2 pin 24. Jump PROM socket 1 pin 22 to PROM socket 2 pin 18. Jump PROM socket 1 pin 19 to PROM socket 2 pin 21, and you are finished. Be sure to install a chip socket on the board for holding the new PROM1 and/or PROM2 chips (rather than soldering them directly to the board). A chip socket will ease future chip replacement or troubleshooting. If you require assistance or wish to have this work performed by a qualified technician, please see our Game Service & Repair page for a list of repair sources. Original system PROM chips U2 and U3 on most Gottlieb System 80 boards are 2332 PROM chips. These chips are the "bios" or "operating system" of the board, and vary from game to game, just like the game PROM1 and PROM2 chips do. So if you are installing a System 80 board that came from a different game, you will most likely need to change not only PROM1 and possibly PROM2 (if used), but also U2 and U3 chips. There were also different versions of U2 and U3 for six-digit scoring games, and seven-digit scoring games, so these chips should always be considered when swapping boards. Original 2332 PROM chips can be replaced by a single 2764 EPROM, using a custom-made adapter, as described below. This procedure requires no modifications to the MPU board, so will retain it's original design and configuration (ie: easily reversible). The adapter houses a 2764 EPROM chip, and the whole unit plugs into a socket at the U3 location on the MPU board. 2332 PROM chips can also be replaced with 2532 EPROM chips, but with more major modifications required as well as some added electronic components. We don't recommend the 2532 replacement method as we don't have very comprehensive information on how to do it, and it does require quite a bit more involved work. Also, 2532 EPROM chips can often be harder to find and considerably more expensive than the more common 2764 EPROM chips. Special thanks to Frederik Swemmer for providing the following info on this custom adapter. Fred has designed and tested this adapter successfully in his own game. 1 small project/hobby PC board (minimum size 8 x 14 holes). Radio Shack sell a nice 2-pack of small project boards for a couple of bucks. 1 or 2 24-pin chip sockets (for replacement of U3 PROM on MPU board, if required, and 1 extra for optional use on header pins under the adapter board). 1 24-pin chip header (for bottom side of adapter board- will connect to bottom of adapter board, and plug into U3 socket on MPU board. A few lengths of jumper wire. Remove old PROM chips at locations U2 and U3 on MPU board. 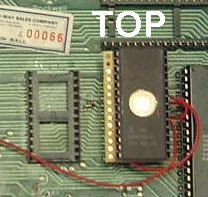 Chips may be socketed (System 80A games), or installed directly on the board (System 80). Install a 24 pin chip socket in location U3 on MPU board (if socket is not already present). The new adapter board will plug into this socket. The solder side (bottom side) of the adapter board, as shown here, should be prepared with connections as shown in this image. Note that some of these connections will be jumper wires, connecting the various points. Be sure to make these connections in this step, as the chip sockets/headers will cover up some of these spots, when installed during the next step. Note that the 28 pin socket for the 2764 EPROM chip will be on the top side (non-solder side) of the adapter PC board. There will be a 24 pin header (two rows of 12 pins each) installed on the bottom (solder) side of the board, which will plug into the 24 pin socket at location U3 on the MPU board. The reference to "Z-10 PIN 5" should be a long jumper wire (approx. 5-6 inches) coming off the left side of the underside of the board, and can be attached in a later step. See the color image in the next step for a better idea of how the jumper wires on the side will look, when board is flipped back over. Mount 28 pin socket ONE position (column) to the right, from the leftmost edge of your PC board. This allows the 24 pin socket/header underneath the board, to occupy the pins of the first position (column) of the board. Note that the two top rows of the PC board (and 28 pin socket) will extend above the old U3 location (and above the 24 pin socket on the bottom side of the adapter board). The board used in this image is cut-down in size to the minimum- 8 columns wide by 28 rows high. If your PC board is larger than this, you can cut it down, or try to mount the components in the lower left corner of the PC board, leaving any "extra board" to the right, and above, the components, as shown here. Install a 24 pin chip header (two rows of 12 pins each) on the solder side (bottom side) of the adapter board. These header pins will plug into the 24 pin socket in location U3 on the MPU board- they are basically like "chip legs" on the bottom of the adapter board. Depending on the type/thickness of the header pins you use, you may want to install a second 24 pin chip socket onto the header pins on the bottom side of the adapter board, to ease the installation into the U3 socket on the MPU. Some types of header pins can be large/round and be difficult to seat into a standard type chip socket. Permanently installing a socket onto these header pins, on the bottom of the adapter board can make the installation into the U3 socket much easier and avoid possible damage to the U3 socket. Install the programmed 2764 EPROM chip onto the top side of the adapter, in the 28 pin socket. Carefully install the whole adapter unit into the U3 socket on the MPU board. Observe chip orientation- pin 1 should be UP if you are looking at the board in the upright position in the backbox (as seen in color image above). If you require assistance or wish to have this work performed by a qualified technician, please see our Game Repair Page for a list of repair sources.